What makes rural services to school-age children different? The end of the year is approaching. For me, that means skyrocketing speculation about the Youth Media Awards (YMAs), which include the Newbery, Caldecott. I love pouring over year-end best of lists and reading as many 2017 books as I can. Another reason I look forward to this time of year: I love a good mock award discussion. 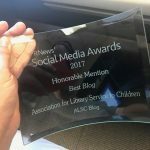 For this blog, I’ll focus on different ways to host a mock award with school-age kids (for more on the benefits of hosting a blog for your colleagues, check out Amanda Foulk’s stellar post on Guessing Geisel).